Why does the Atlanta Streetcar keep closing during big events? City develops tourist/event focused region of downtown. City builds streetcar in downtown, largely focused on tourist transportation. City closes streetcar for most big events for tourists. Why? These events are times when people could actually make use of a streetcar that runs fairly empty most of the time. This is a wasted chance to make it useful, and a wasted chance to follow through on our city leaders’ various calls for Atlanta to become a more transit-oriented place. We have to find a way to prioritize transit on these streets during big events and truly encourage attendees to arrive by means other than cars. It would certainly be nicer for pedestrian activity during big events if transit was the priority. The streetcar can run a short loop. Why close the whole thing? Yes, the streetcar can get stuck in traffic in a couple of spots, since it shares a lane with cars. But even if there’s not the possibility (or the political will) to prioritize the streetcar on the blocks near Centennial Olympic Park where car traffic builds up during events, that’s no reason to shut down the entire route. Shutting down the whole thing is ridiculous for at least two reasons. First: what happens when the streetcar finally expands and reaches the Beltline and more? Will the city shut the whole thing down during every big event? There has to be a sustainable model established for dealing with this. Second: The streetcar route was intentionally designed to allow either “half” of the figure-8 loop to be closed independently (the nexus on of the figure-8 is at Woodruff Park). At a minimum, they could still run the line in a loop between Woodruff Park and the King Center. It’s like they’re not even trying. These major events should have had long-term plans and messaging that don’t get trumped (pun intended — President Trump is expected to visit the championship game) at the 11th hour by car-prioritization. Tell fans they need to park their cars far away and then take other transportation to the game and related activities. It’s likely that the explanation for prioritizing automobiles on the streetcar route is that, since the teams are from Georgia and Alabama, more fans will choose to drive than if they were from further away. But the operative word is “choose” and we should help influence those decisions for the good of everyone not the (relative) few who choose to drive in for a game. The Atlanta Streetcar has already been included in promotional materials for the game that encourage attendees to ride it, adding insult to injury. The official “Know Before You Go” website for the championship game is promoting the streetcar. 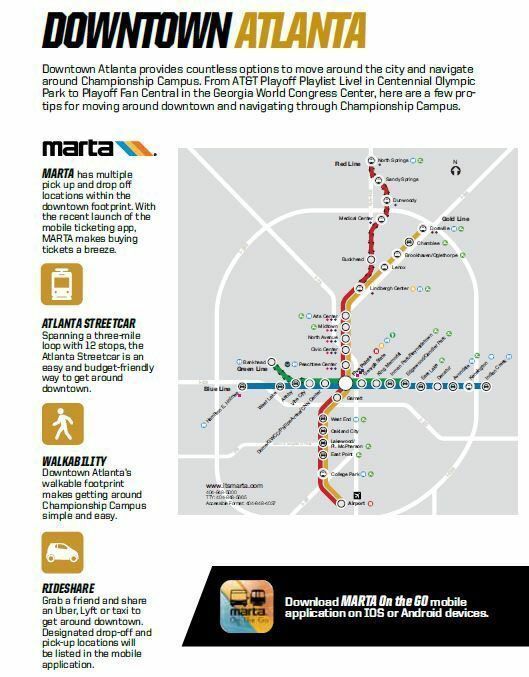 And the City of Atlanta tweeted that attendees should take the streetcar, including this graphic showing transportation options that highlight the streetcar. Image tweeted by the City of Atlanta, promoting the streetcar during the events. Atlanta is hosting the Super Bowl in 2019. We have to demand that the streetcar keeps running at least on its normal level of service and hours during that event (preferably expanded service), as a sign that this city is serious about moving the needle boldly in the right direction on transit. The streetcar was designed specifically to meet the needs of big events, something that’s spelled out in the TIGER grant application. This is beyond mere frustration with bad planning. In light of this language from the TIGER document, the city is obviously failing to follow through on the goals of the streetcar — the very goals that garnered millions of dollars in federal funding for the buildout. Tacit in this closure is an admission that the streetcar isn’t for moving people into downtown, but moving tourists from Downtown to other tourist spots, so there’s no need for it to run during the event. This defies logic. We’re should benefit from the streetcar when all the people are coming to the game – they could park their car in a garage and go to a variety of tourist spots, restaurants, and bars on the streetcar. It’s an indictment of the supposed spillover benefits the area outside the Georgia World Congress Center complex is supposed to receive. And it’s a clear sign that Atlanta leaders need to walk the walk with promotion of transit in the city. Talking the talk has only gotten us so far.